Our “Stuff” also steals our energy and saps our strength! Studies show that all that emotion we have invested into our “Stuff” affects our health and well being; and that takes a toll on us! Whether we are aware of how it is affecting us or not…it IS there, and it IS REAL! One way to do a gut check with ourselves on this subject is to pay closer attention to that quiet little voice that lives in our subconscious always chattering at us. What’s it saying? Is it saying things like: “Are you ever going to get all that stuff sorted? It’s been forever and you still haven’t done it; what is wrong with you? You are such a disaster; you never get anything done! Your house is a mess! You should be ashamed of yourself! What would your Mother say if she saw this; Her house never looked like this. I just don’t have time with everything going on right now, but I know I need to get it done. But where am I going to put it all? I don’t know what to do with all this? I want to get rid of some of this…but what if I need it someday and then I don’t have it. That would be so wasteful!” And on and on it goes! Sound Familiar? The good news is….once you become aware of this negative self-talk you can change it. The first thing to realize is that you aren’t alone! Everyone is dealing with the same problem at some level, so don’t be so hard on yourself! Don’t stay in overwhelm! When you look at everything at one it will seem so overwhelming that you never get started. Just pick one stack to sort through, or one box to go through, or one closet to start on….Don’t think everything has to be done at once. It’s a BIG job; so just chunk it down! 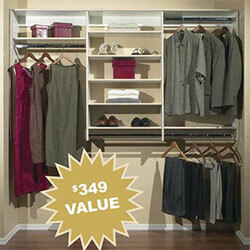 There are also Professional Organizers who can help you with the sorting and organizing. Just go to the website for The National Association of Professional Organizers to find a professional in your area. Here is a list of questions to ask when hiring a professional organizer that you can download. Another resource for finding a professional organizer is FindmyOrganizer.com. We can also personally refer you to professional organizers in the Greater Salt Lake Area that our Design Team have worked with… and we even have a Promotion where we give you an Hour with a Professional Organizer for FREE if you make a minimum purchase with us. Our Professional Design Team is also available to assist you! It makes a huge difference when you have a specific, designated place to put things! And you would be amazed at how much “stuff” can be fit even into a very small space if it is designed for maximum storage efficiency… our Professional Design Experts can truly make magic happen! Just call for your FREE Consultation and they will take the burden away and create a space you love to be in!